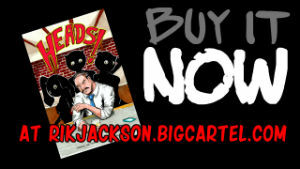 I am Rik Jackson, a comic book artist and illustrator from south London. I draw and write scifi private detective comic Heads! and heavy metal horror comedy Rock In Purgatory, among other awesome comics projects. My first EC comics style horror comic Brutal Bombshells was published in 2015 and since then I’ve had work featured in indie comics anthologies, webcomics sites and horror magazines. When I need a break from drawing comics I draw horror and pinup girls, plus anything anyone cares to commission me for. Rather than list influences, take a look at my gallery or read my comics to get an idea of what I do. Or you can read my blog, where I regularly post articles about artists, movies, models and bands who inspire me. Plus you will find info on any upcoming projects or events I am involved in. When I’m not drawing awesome things, I am the vocalist in metal band Circus Diabolica.